Whether you are measuring the results of a single Facebook ad or a comprehensive media campaign, there are hundreds of different metrics to report on. The real question is, which metrics should you be examining to determine success? You must start by identifying what your end goal is. What are you trying to achieve? Without knowing the end game, metrics lack context, making it nearly impossible to tell whether you’ve been successful. Take engagement, for example. It’s a pretty important metric–perhaps the most important–for determining what content is resonating with your audience on social channels. But likes, comments and shares are not directly connected to sales goals. So if your intent is to fill your sales pipeline with top-of-funnel leads, for example, engagement metrics won’t tell you much about how you’re doing to move that needle. 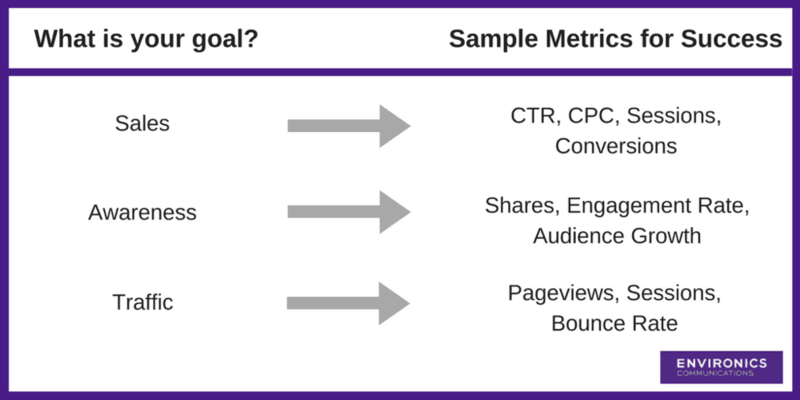 What engagement metrics can tell you is whether you’re delivering the right content–content that your audience deems valuable–to them in the right way (in other words, on the right channel, with the right tone, and in the right medium). And ultimately, engagement can be an early indicator of whether you’re well-positioned to drive leads. 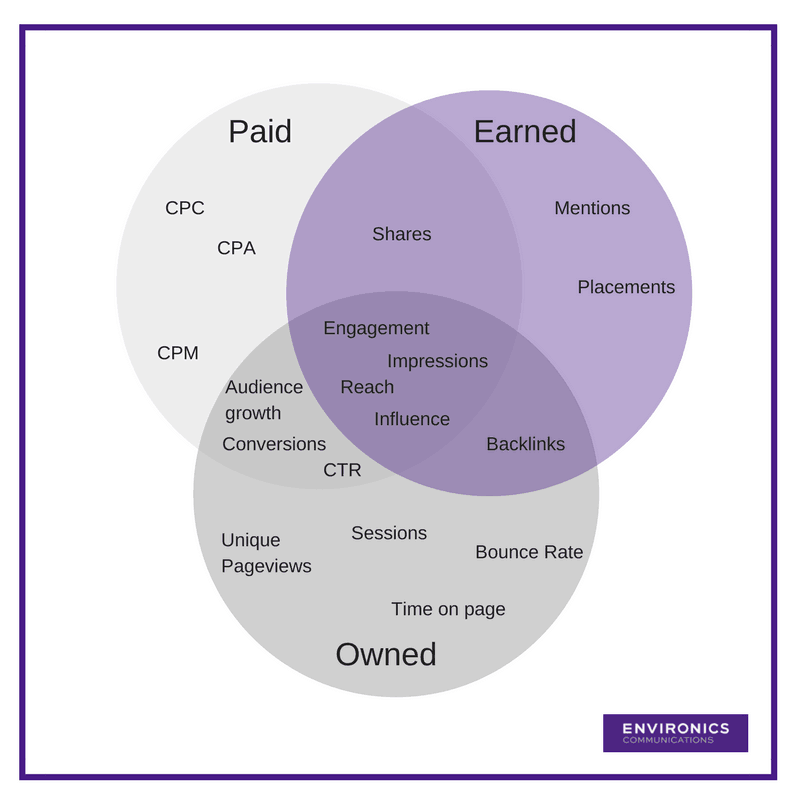 The right combination of earned, owned and paid metrics is different for every effort. Here are a few we track to determine campaign success. Mentions: The number of times someone/something is referenced. Placements: The amount of news media coverage that an organization, event, or article receives. Impressions: The number of times a post is displayed, whether the post is clicked on or not. A user might see a page update in a news feed once, and then a second time when one of their friends shares it. Engagement: The number of times people have engaged with your content in terms of likes, comments, and shares. Pageviews: A view of a page on your site that is being tracked by Google Analytics. If a user clicks reload after reaching the page, this is counted as an additional pageview. Sessions: A group of interactions one user takes within a given timeframe on your website. Click-through-rate (CTR): Percentage of users who click on your link/page/ad per impression. Conversions: An action a user takes on your website such as joining your email list, adding an item to the shopping cart, or downloading a piece of content. Cost-per-click (CPC): The actual price you pay for each click in a pay-per-click (PPC) marketing campaign. It’s imperative for communications professionals to stay at the forefront of metrics reporting. Digital trends and social media platforms’ capabilities are constantly changing. Since the beginning of this year, Facebook’s algorithm changed to weigh “Reactions” more than “Likes” and prioritize videos in your News Feed based on the completion rate. To stay ahead of the game, follow digital influencers on Twitter, read those emails from Facebook and Twitter or subscribe to email newsletters. Ultimately, one metric isn’t going to tell the full story. Finding the right combination for you will lead to campaign wins and a positive ROI. Want to talk about what “secret sauce” of metrics reporting is right for you? Give us a shout, and stay tuned for our next post to find out which tools you should use for measurement.